Just in case you needed more proof that you don’t actually need designer labels to attract attention, here’s the story of Kara Koskowich, who created her prom dress out of old homework. After graduation, most students never want to look at homework again, but 17-year-old Kara Koskowich actually decided to look good IN it, by making a unique prom dress out of her old math homework. “For me, it’s not a big, spend your money, you have to look this nice, you have to fit into this mould of grad,” the Canadian girl told CBC, so she decided on a more creative and far less expensive alternative to the classic prom dress. So instead of going window shopping, Kara started thinking about what would make a really interesting dress for prom. And although she had made up her mind since March, and even started working on the dress back then, she only barely managed to finish it in time for the big night. ”I did most of it the last week because I’m that kind of person. I procrastinate,” Kara said. 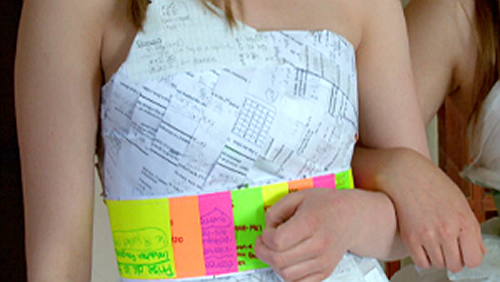 Kara Koskowich made her stunning prom dress out of 75 pages of her old math homework, and complemented it with a nice belt made of colored post-its. The resourceful student decided on math because she says “it’s the most intricate to look at”, and help her achieve that explosion-like pattern. She spent days cutting, sewing, gluing and eventually tailoring the prom dress exclusively out of sheets of paper. But the hard work paid off, both for her and her friend Dorothy Graham, who made her dress out of shopping bags, as theirs were the most admired garments at prom. It was actually funny because everyone was wearing these elegant dresses, and we’re in dresses that cost nothing, and we were the most popular people there,” Dorothy said. Well done girls! And they aren’t the only ones who thought about getting creative with their prom dresses. In fact we’ve featured a few of the most original prom outfits in history right here, on Oddity Central. Check out the duct tape costumes of Stuck at Prom, a beautiful dress made from candy wrappers, and another one made from pop tabs.